Examples of thickening agents include: polysaccharides (starches, vegetable gums, and pectin), proteins (eggs, collagen, gelatin, blood albumin) and fats (butter, oil and lards). All purpose flour is the most popular food thickener, followed by cornstarch and arrowroot or tapioca. All of these thickeners are based on starch as the thickening agent. Starch or amylum is a carbohydrate consisting of a large number of glucose units joined together by glycosidic bonds. This polysaccharide is produced by all green plants as an energy store. It is the most important carbohydrate in the human diet and is contained in such staple foods as potatoes, wheat, maize (corn), rice, and cassava. Image Left: Structure of the amylose molecule. Image Right: Structure of the amylopectin molecule. Pure starch is a white, tasteless and odorless powder that is insoluble in cold water or alcohol. It consists of two types of molecules: the linear and helical amylose and the branched amylopectin. Depending on the plant, starch generally contains 20 to 25% amylose and 75 to 80% amylopectin. Starches thicken by a process called gelatinization. Starch gelatinization is a process that breaks down the intermolecular bonds of starch molecules in the presence of water and heat, allowing the hydrogen bonding sites (the hydroxyl hydrogen and oxygen) to engage more water. This irreversibly dissolves the starch granule. Penetration of water increases randomness in the general granule structure and decreases the number and size of crystalline regions. Crystalline regions do not allow water entry. Heat causes such regions to be diffused, so that the chains begin to separate into an amorphous form. Some type of unmodified native starches start swelling at 55 °C, other types at 85 °C. Gelatinization is also known as the thickening of a liquid. The starch grains/flour granules absorb the liquid. When heated the grains/granules swelling and then burst, releasing starch into the liquid. The granules/grains swell to 30 times their original size (swelling power, peak viscosity). HOW ARE THE DIFFERENT TYPES OF STARCHES DIFFERENT? Cornstarch -- Cornstarch is actually a flour. It is the endosperm of corn kernels that has been dried and ground. Corn starch is used as a thickening agent in soups and liquid-based foods, such as sauces, gravies and custard. It is sometimes preferred over flour because it forms a translucent mixture, rather than an opaque one. As the starch is heated, the molecular chains unravel, allowing them to collide with other starch chains to form a mesh, thickening the liquid. It is usually included as an anti-caking agent in powdered sugar (10X or confectioner's sugar). For this reason, recipes calling for powdered sugar often call for at least light cooking to remove the raw corn starch taste. When using corn starch, first mix it with cold water (or another liquid) until it forms a smooth paste, and then add it to whatever is being thickened. If it is added directly into the cooking food it will form lumps that are then difficult to mash out for a smooth mixture. An easy way to make certain that all the lumps are gone from the corn starch/water mixture is to put the two into a jar with a screw on lid and vigorously shake the sealed jar until the lumps are gone. This also works with a flour/water mixture. This method also allows for better portion control when slowly adding it to a soup, sauce, or gravy. Potato starch -- Potato starch is not potato flour. Potato flour is dehydrated potatoes ground into powder and is much heavier and denser. Potato starch is the result of an extraction process removing the starch only from the potato. Potato starch has no gluten. Like cornstarch, you have to dissolve the potato starch in a little bit of water before adding it as a thickener. Many people especially prefer starch made from potatoes or corn when thickening sauces because it can help the sauces remain translucent; whereas flour creates a more cloudied appearing sauce. Potato starch is used to thicken soups and gravies. Liquids thickened with potato starch should never be boiled. It is used in recipes for those who are gluten intolerant. It is naturally gluten free. It is similar in use to Arrowroot and corn starch. Its main advantage over other starch thickeners is that it's a permitted ingredient for Passover, unlike cornstarch and other grain-based foods. Arrowroot --Arrowroot is like other pure starches, however, arrowroot is almost pure carbohydrate and devoid of protein, thus it does not equal wheat flour nutritionally. It is recommended to mix arrowroot with a cool liquid before adding to a hot fluid. The mixture should be heated only until the mixture thickens and removed immediately to prevent the mixture from thinning. Overheating tends to break down arrowroot's thickening property. Substitute two teaspoons of arrowroot for one tablespoon of cornstarch, or one teaspoon of arrowroot for one tablespoon of wheat flour. The lack of gluten in arrowroot flour makes it useful as a replacement for wheat flour in baking. Rice flour-- (also rice powder) is a form of flour made from finely milled rice. It is distinct from rice starch, which is usually produced by steeping rice in lye. In Japanese, rice flour is called either komeko or mochiko. Rice flour is a particularly good substitute for wheat flour, which causes irritation in the digestive systems of those who are gluten-intolerant. Rice flour is also used as a thickening agent in recipes that are refrigerated or frozen since it inhibits liquid separation. All purpose flour --Flour is often used for thickening gravies, gumbos, and stews. It must be cooked thoroughly to avoid the taste of uncooked flour. Roux, a mixture of flour and fat (usually butter) cooked into a paste, is used for gravies, sauces and stews. Note: Cornstarch and arrowroot will thicken more efficiently than flour since they contain no protein. They have 50 to 100% more thickening power than flour and thus, less of them is needed. They also thicken at a somewhat lower temperature and do not need to be precooked, like roux. However, they do need to be dissolved in fluid first. Kuzu (kudzo or japanese arrowroot)- Kuzu is a very high quality starch thickener with a smooth texture and neutral flavour. It is from the root of the Kudzo that is naturally extracted from the roots of the Kuzu plant (Pueraria montana) one of Japan’s most vigorous mountain plants. In Japan, the plant is known as kuzu and the starch named kuzuko. Health benefits of Kuzu root --Kudzu contains a number of useful isoflavones, including puerarin (see abstract about puerarin) , about 60% of the total isoflavones, and also daidzein (an anti-inflammatory and antimicrobial agent) and daidzin (structurally related to genistein). A half to one tablespoon of kuzu will thicken one cup of liquid (1 ¾ tbsp. of Kuzu can replace 1 tbsp of corn flour). Kuzu comes a solid and needs to be dissolved in a cold liquid before adding it to anything hot. Stir constantly when heating until the milky white becomes clear. Kuzu is Fat and sodium free. Kuzu although often refered to as japanese arrowroot is very different. Kuzu is far superior in jelling strength, taste, texture, and healing qualities. Chef David Bouley frequently uses Kuzu in place of other thickeners in many of his dishes. Polysaccharides as a thickener food includes the starches, vegetable gums and pectin. Food starch is a flavorless powder in which comes the cornstarch, potato starch, katakuri starch. Polysaccharides are polymeric carbohydrate structures, formed of repeating units either mono- saccharides( e.g., glucose , fructose , galactose) or di-saccharides ( e.g., sucrose, lactose) joined together by glycosidic bonds. Vegetable Gums are all polysaccharides of natural origin, capable of causing a large viscosity increase in solution, even at small concentrations. In the food industry they are used as thickening agents, gelling agents, emulsifying agents, and stabilizers. Agar --Agar or agar-agar is a gelatinous substance derived from a polysaccharide that accumulates in the cell walls of agarophyte red algae. Historically and in a modern context, it is chiefly used as an ingredient in desserts throughout Asia and also as a solid substrate to contain culture medium for microbiological work. The gelling agent is an unbranched polysaccharide obtained from the cell walls of some species of red algae, primarily from the genera Gelidium and Gracilaria, or seaweed (Sphaerococcus euchema). Chemically, agar is a polymer made up of subunits of the sugar galactose. Guar gum --Chemically, guar gum is a polysaccharide composed of the sugars galactose and mannose. The backbone is a linear chain of ß 1,4-linked mannose residues to which galactose residues are 1,6-linked at every second mannose, forming short side-branches. Guar gum is economical because it has almost 8 times the water-thickening potency of cornstarch - only a very small quantity is needed for producing sufficient viscosity. Thus it can be used in various multi-phase formulations: as an emulsifier because it helps to prevent oil droplets from coalescing, and/or as a stabilizer because it helps to prevent solid particles from settling. . At (acidic) pH levels below 4.5, guar gum has sharply reduced aqueous solubility, thus also reducing its thickening capability. Xanthan gum --Xanthan gum is a polysaccharide, derived from the bacterial coat of Xanthomonas commonly used as a food thickening agent (in salad dressings, for example). Xanthan gum is a long chain polysaccharide composed of the sugars glucose, mannose, and glucuronic acid. 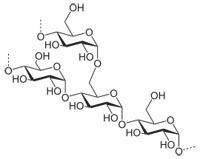 The backbone is similar to cellulose, with added sidechains of trisacharides (three sugars in a chain). One of the most remarkable properties of xanthan gum is its ability to produce a large increase in the viscosity of a liquid by adding a very small quantity of gum, on the order of one percent. In most foods, it is used at 0.5%, and can be used in lower concentrations. In foods, xanthan gum is most often found in salad dressings and sauces. It helps to prevent oil separation by stabilizing the emulsion, although it is not an emulsifier. Xanthan gum also helps suspend solid particles, such as spices. Also used in frozen foods and beverages, xanthan gum helps create the pleasant texture in many ice creams, along with guar gum and locust bean gum. Pectin Pectin is a kind of polysaccharide (Polymer of D-Galacturonic Acid) that is obtained from plant such as citrus fruit peel, apple peel etc. Pectin is a vegetable gum and food thickener that is used to make gel. In human digestion, pectin goes through the small intestine more or less intact. Pectin is thus a soluble dietary fiber. The main use for pectin is as a gelling agent, thickening agent and stabilizer in food. Pectin does not add any flavor to a dishes but it does work extremely well as a thickening agent. Egg yolks --Egg yolks are the most efficient protein thickeners in part because they are so concentrated with protein, have a rich flavor and offer a velvety smooth texture. The difficulty in using egg yolks is the small window of temperature needed to thicken the sauce or soup but not allow the egg to set. See: temperatures in cook. Collagen --a protein found in nearly all connective tissue, when cooked it will dissolve and thicken sauces. Gelatin - a protein produced by partial hydrolysis of collagen extracted from the boiled bones, connective tissues, organs and some intestines of animals. Butter is the best thickener to use for wine and stock based sauces. Make sure that the butter is whisked in off the heat or the emulsion can separate. Reduction The most flavorful way to thicken a sauce is by reduction. Reduce the moisture content of a sauce by simmering over low heat and letting evaporation take over. As the water evaporates the remaining ingredients become more concentrated. Stocks made using meat bones and/or vegetables take on a thicker appearance. Adding fats toward the end of the reduction process can complete the thickening process. After a reduction to a syrup consistency butter as softened cubes can be whisked in either on a very low flame or off the heat. Too much heat can cause the emulsion to break. Adding some pureed vegetables or tomato paste is another ideal way to thicken a soup or sauce. This can add both texture and additional flavor.